Infuse global flavor into your next pizza with this campfire Berber pizza, Aka, Moroccan Lamb Pizza. 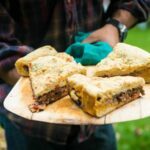 A fun stuffed bread baked over a classic campfire. First, make a fire and arrange your tri-pod according to the heat. You will want moderate heat for this cook and solid cast iron. Combine water, yeast, and sugar in a heavy bowl, mix thoroughly. Let sit until yeast bubbles, about 5 minutes. Add salt and remaining flour, mixing until the dough becomes shaggy and loose. Working with your hands, fold and shape together the dough until it forms a cohesive ball. Cover and set aside. Wipe out your Dutch oven and heat it over the fire for about 30 minutes. Coat the inside of the pan with olive oil and add the onions and peppers and saute about 5 minutes, until soft. Add the garlic and cook 30 seconds longer. Carefully remove from the pan. In a large bowl, add lamb and spices to the onion mix. On a clean lightly floured work surface, divide dough into two equal portions. Shape one half of the dough into a ball. With a pin or your hands, press and roll the ball of dough into a large flat circle, about 10” in diameter and ½” thick. Dust a pizza peel or easily maneuvered cutting board with cornmeal or flour. Transfer the disk to the pizza peel. Place the lamb filling onto dough, covering evenly, leaving a ¾” border from the edge. Shape the remaining dough into a ball and roll out into a similar round to the first. Wet the outer edge of the lower dough with a bit of water, then cover the dough and filling with the second half, pressing to seal, and slightly rolling the edge under, on itself. Carefully slide the pizza into Dutch oven and cover. Check at 20 minutes, then more frequently. When the upper crust is dry and the bottom is crisp, it is done, raising or lowering from proximity to heat as your fire needs. Carefully remove from heat and Dutch oven and allow to cool for 5 minutes before slicing and serving. Alternatively, this dish can be baked in an oven pre-heated to 400 degrees for 35-40 minutes. Watch the dough carefully to make sure the bottom doesn't burn as the top crisps up.